SUMMARY: Continually improving an online shopping experience is key to success. However, when your development capabilities are limited and changes are costly, providing a consistent and easy-to-use site is a challenge. Learn how Rescue Spa brought on a new site vendor as well as incorporated features, including live chat, checkout improvements and a more consistent brand experience, that led to a 286% revenue increase since the site launch. Rescue Spa, a boutique spa in Philadelphia, Pa., specializes in upscale beauty products and services. Providing services including facials, massages and hair styling among others, Rescue Spa turned to an ecommerce platform to make the products sold in-store also available online. Soon after the spa's 10-year anniversary, the site launched with the aid of a vendor and was proprietary. "They owned it, so I couldn't make any changes that I needed to make. Simple things like changing a description or putting in a new image was on lockdown. I couldn't do my job," said Kim Zimmerman, Ecommerce and Public Relations Manager, Rescue Spa. Anytime Zimmerman wanted to change something on the site, she had to reach out to the vendor and pay for the changes she wanted to make. Aside from a poor system in updating the site, Zimmerman explained the original site itself was "ancient" and not user-friendly. "A couple of clients who came into our spa were buying things online, but I had to guide them through every step of the process because it was difficult to use," Zimmerman said. Poor user experience coupled with low online sales led to the team rethinking how Rescue Spa provides products online. Customers of Rescue Spa range from clients familiar to the spa's brick-and-mortar location to customers looking for exclusive, high-end skincare products on the Web. Ages can range from young women in their teens to mature women. In November 2011, the team was on board to begin looking for a new solution for the ecommerce site. Zimmerman wanted to not only be able to edit the site on a regular basis without being charged for every change, but to also take the site to the next level with new features. Partnering with a new vendor, the team was encouraged to also incorporate a company blog to provide valuable content for Rescue Spa's audience of current and potential customers as well as provide rich product descriptions. With the problems mounting, Zimmerman explained that partnering with a new ecommerce vendor that would meet the needs of the company was a no-brainer. Having worked with the new vendor at a previous company, Zimmerman had seen the results achieved and knew the potential. "So after working with [previous vendor], I thought, 'If we're going to have an online store here at Rescue Spa, I can't work with this company,'" Zimmerman said, adding that the previous vendor even charged for resizing images on the site. Aligned with a new solutions provider, the team was ready to start fresh and launch a new site for Rescue Spa products as well as begin maintaining a blog for posting content relevant to Rescue Spa's audience. As part of the newly launched website and blog, Zimmerman incorporated a live chat feature to the site to further enhance the customer experience. Biologique Recherche is a slightly complex product line Rescue Spa offers, with different products making up the regimen. Zimmerman explained that many clients submitted questions via email or would reach out to Rescue Spa over the phone. She saw this as an opportunity to try out a live chat feature as a way to keep potential customers engaged with the ecommerce site. "I've gotten a lot of really solid clients from the live chat. Some people have quick questions, and then other people may need more attention," Zimmerman explained. However, through the efficiency of having the live chat, Zimmerman is able to take care of her workload at Rescue Spa and still easily attend to clients. Zimmerman is the main voice for Rescue Spa on the live chat feature, along with support from her colleagues. She explained through implementing the live chat feature those interacting with it have a higher propensity to purchase. Once a client has interacted with Rescue Spa via live chat, Rescue Spa has seen a 30% increase in conversion simply from getting their questions answered. Rescue Spa's main product, Biologique Recherche, has its own challenges in being sold online. The company has a stringent policy against allowing retailers to sell the product online. 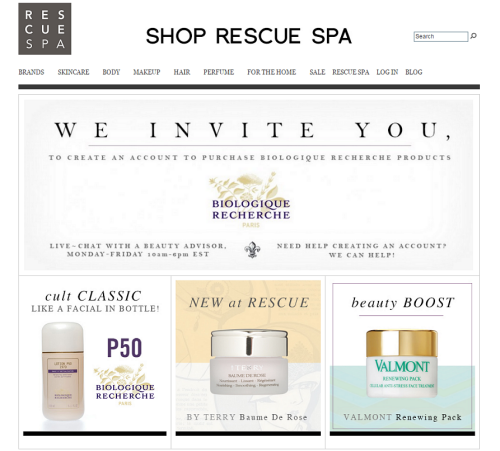 Rescue Spa reached out to Biologique Recherche and explained that having clients who are out of the Philadelphia area, they need to reorder products conveniently if they can't make it into the spa. Zimmerman leveraged that the spa is a trusted store by its clients and achieved buy-in to be able to sell Biologique products on Rescue Spa's ecommerce store. However, there was a caveat. A potential customer looking to purchase Biologique online would have to set up a username or password to be able to view a product's price and purchase. "They call it a prescription, so it's kind of like they know … whoever is purchasing it really intends to use the Biologique Recherche line and not just dabble in it. Because they're an upscale French brand, they have a really interesting way of selling their brand. They want to keep exclusivity and integrity," Zimmerman explained. Zimmerman combatted this challenge by making the login process as simple as possible. For Rescue Spa's older clientele who aren’t as computer savvy, she explained that this was an obstacle that had to be explained to new users. "For Biologique Recherche products, all retailers are supposed to have the same price. Once they log in and realize that it's a very difficult brand to get their hands on, they are less frustrated with us when they realize it's not us, but Biologique, enforcing the log in," Zimmerman explained. 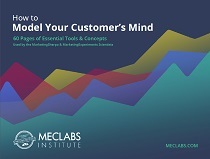 In spite of the challenge of a locked purchase process, by providing these exclusive products the company trimmed down its competitive landscape. Other customers using Biologique products who have not been able to purchase the products from online retailers could now turn to Rescue Spa to purchase. The registration process on Rescue's site also allowed the team to capture information on these new customers. 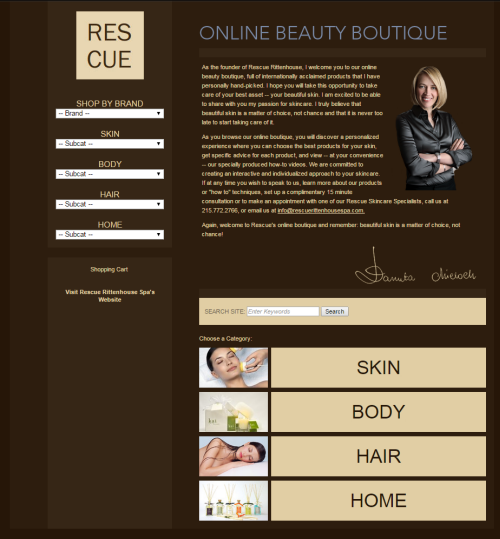 In launching the new Rescue Spa site, the team also sought to improve the checkout process. The team implemented PayPal checkout options as well as Checkout by Amazon. "We had been selling Biologique Recherche and other products on Amazon and were doing very well with it, and then the brand asked us to discontinue selling on Amazon. We realized the convenience of Amazon, so we put Checkout by Amazon as a payment options, and it proved to be helpful," Zimmerman said. With all of these improvements to user experience, the team at Rescue Spa also updated the site to better reflect the brand's personality. "The old was site was very clunky … this new site reflects the spa. It looks like Rescue," Zimmerman said. As far as testing elements of the site to truly discover more insights on what works best, Zimmerman explained the team is waiting to upgrade the site further before launching any testing. "We have some ideas of what we'd like to do, but at the moment, we're keeping everything pretty straightforward, trying to put a personal touch on things," Zimmerman explained, citing speaking to customers through quotes from the owner or explaining products in layman's terms rather than industry jargon as examples. To help drive more traffic to the site, Zimmerman explained that the team is promoting it to many clients who call in to place an order, directing them to log in and purchase online. In the spa location, the website is also promoted at checkout, especially if the client is not from the Philadelphia area and expresses an interest in purchasing more products from Rescue. In addition to transforming the site to provide a better experience for Rescue Spa customers, Zimmerman also continues to publish content on the Rescue Spa blog. "I post whatever content that would be helpful to spa-goers and people who just shop on the site. I can't just do spa posts because there are people who don't live in the area, and I can't just do products either because I don't want to come off as too commercial," Zimmerman said. Instead, Zimmerman channels the Rescue brand voice to share content that is helpful to their audience. Zimmerman posts content several times a week, leveraging beauty and skincare tips, hair styling ideas as well as pulling media mentions of Rescue Spa's most popular skincare product offering, Biologique Recherche, and writing supporting content around it. In authoring posts, Zimmerman explained it's a team effort, leveraging experts at Rescue as well as conducting external research. 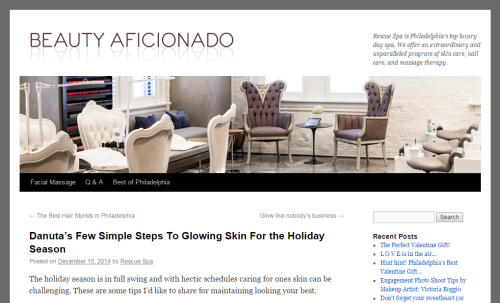 "I get blog entries from estheticians. I send out emails and encourage people to write posts; the owner writes posts occasionally, and some of it I come up with on my own as well," Zimmerman said. Within the first four months of the revamped site's launch, the team matched the revenue they achieved in the previous eight months. Overall revenue growth has been an average of 175% each year. Within the first year of having the new site, revenue has increased 286%. Zimmerman attributes a large part of the website's success to providing a better experience and better customer service, particularly with the help of the site's live chat. "I want everyone to get the best experience they can have because not everyone has the luxury of coming into the spa, but we want them to have that feeling that they're being catered to," Zimmerman explained. In the future, Zimmerman wants to continue to redesign the look and feel while cleaning up the search functionality to provide relevant results easier.